Rare expertise, craftsmanship, extremely fine parchment (goatskin) is used to cover certain exceptional pieces of furniture created by Philippe-Hurel. These days those practising the craft of furniture upholstery using parchment are very rare. 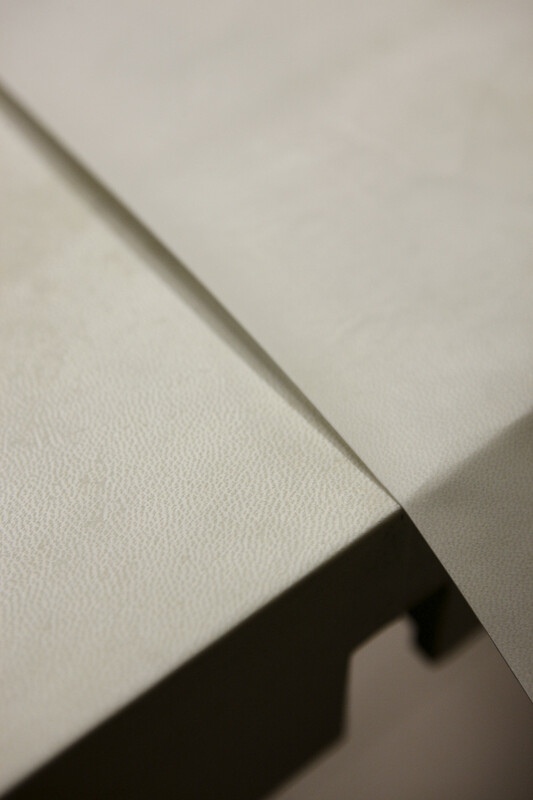 Extremely fine parchment (goatskin) is used to cover certain exceptional pieces of furniture created by Philippe-Hurel. These days those practising the craft of furniture upholstery using parchment are very rare. Water-based fixation, masking, light polishing, tainting or patine or even waxing; the process is exclusively artisan and manual and requires hours of work depending on the specific form demanded prior to the posing of the parchment. A truly noble touch that requires a craftmanship and expertise that Philippe Hurel aims to prevent from disappearing into the annals of the lost arts of bygone days. The seat bottom of the Tadeus bench is elegantly dressed in milky-white parchment by expert hands.